While the lake can be serenely mirrorlike, at any time, winds can be funneled into a venturi effect” between Mount Konocti and Kono Tayee, causing huge gusts to whip up white caps. This often can be seen as large ripples on the distant water—at these moments, head back toward your launch spot or hug the shore. As you start out, paddle along the shoreline. You will pass numerous docks, heading west to the “narrow” spot in the lake. To the north, a velvety hill towers more than 2,000 feet above the water—Kono Tayee (1). In 1874, Captain Samuel Floyd, a wealthy seaman, built an estate on 300 acres at the base of the hill. Once considered one of the finest mansions in Lake County, the property was sold to a developer in 1963, and the house was demolished to create a lakeside residential development. Today, one can still see remains of the incredible array of exotic plants and trees that were collected during his world travels. You are in the aptly named “Narrows”. As you look around, imagine life in the 1800s. This was once the hub of travel from Lakeport to Lower Lake and Sulphur Bank in Clearlake Oaks. The first boats on the lake were Native American dugouts and tule canoes made from tied reeds. By the mid-1800s, sailboats were used as working vessels, hauling supplies from dock to dock. Steamers – introduced by Captain Samuel Floyd in the 1870s – could make the trip from Lakeport to Lower Lake in only three hours, while a horse and wagon team would take a full day. At this point, Mount Konocti begins to dominate the view, its highest peak rising to an altitude of 4,299 feet above sea level (2,973 feet above the lake’s surface). A dormant volcano, Mount Konocti is estimated to have first erupted about 350,000 years ago and as recently as 10,000 years ago. Mount Konocti (Pomo: “konoc” mountain, and “ti” big) is considered sacred by Native Americans and archaeological evidence suggests native people, principally Pomo and Wappo, have inhabited the surrounding area for up to 11,000 years. Ahead, you will see a small group of willows surrounded by tule wetlands. Small Howards Island (3) is often under water but can be a great place to stop and tie off to rest a bit and enjoy the view. As you face Mount Konocti, notice the dark, heavily forested area on the northeast slope. Known as the “Black Forest,” this area never gets direct sunlight and consists of heavy groves of Douglas fir. Head east, paddling past Weekend Island (4), noticeable for its windmill, and then Fruit Island (5), both of which are private residences. Just ahead is Windflower Point and a small canal marked by a rock light. 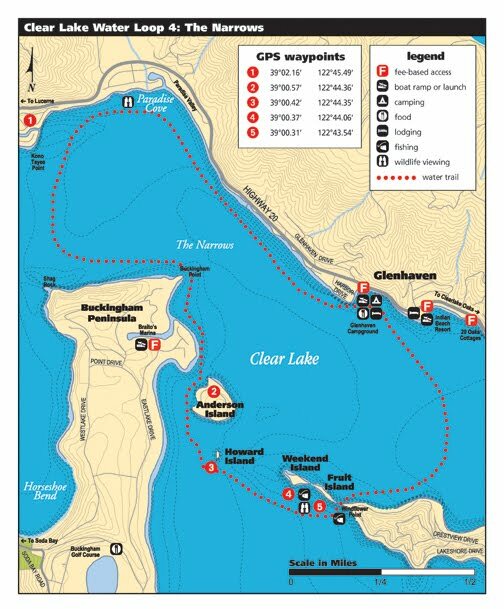 Paddle through here to get back to the Clearlake Oaks Arm of the lake and back to your launch spot. Indian Beach Resort – 9945 E. Hwy 20, Clearlake Oaks. Launch, beach, lodging, rentals, day use. 20 Oaks Cottages – 10503 E Hwy 20, Clearlake Oaks. Dock, beach, lodging, day use. Braito’s Marina – 1555 Eastlake Drive, Kelseyville on Buckingham Point. Launch only.